By using a simple and rapid technique, the degree of vessel deviations in the stem xylem could be evaluated and compared between different plant species. The degree of vessel deviations was suggested to be one of the main factors determining the hydraulic integration in woody stems. 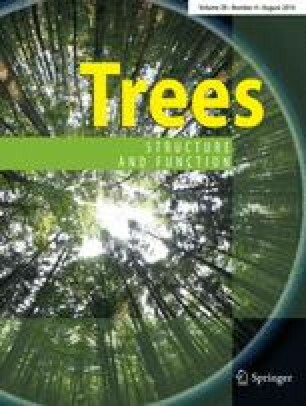 The main objective of this study was to investigate the role of vessel tangential deviations in determining both intervessel connectivity and patterns of hydraulic integration in woody stems of six Fabaceae trees. It was hypothesized that increasing the degree of vessel deviations would increase lateral contacts between vessels thereby increasing hydraulic integration within stems. Species-specific differences in vessel deviations and intervessel connectivity were quantified by following the movement of an apoplastic dye that was injected to a limited number of vessels. Intervessel connectivity was measured as the number of laterally connected vessels, whereas the degree of vessel deviations was measured as the magnitude of divergence of a group of neighboring vessels. Hydraulic integration index was determined as the ratio of tangential to axial conductance. Results showed that the degree of vessel deviations differed significantly between species. Acacia cyanophylla showed the lowest degree of vessel deviations (1.75 ± 0.33), while the highest degree was observed in Acacia etbaica (2.48 ± 0.26). Hydraulic integration was positively correlated more with vessel deviations than with intervessel connectivity. Only a very weak positive correlation was observed between vessel deviations and intervessel connectivity. Tangential deviations in the course of vessels might be one of the main factors determining the patterns of integrated–sectored transport in woody stems and, consequently, might have ecological implications in terms of plant adaptation to various ecological conditions. This study confirmed the complexity of interactions in the xylem hydraulic system. OEB and AL performed the experiments and analyzed the data; YH, MLB, and MB designed the study and wrote the paper; YH had primary responsibility for final content. All authors read and approved the final manuscript. This work was supported by the Scientific and Technical Research Centre for Arid Areas, CRSTRA (National Research Fund). We are thankful to Maamar Bouhanna (Sidi Bouhanna) for the technical support. This manuscript was improved substantially by helpful comments from Dr R. Mayouf. Special thanks are extended to the anonymous referees for helpful comments on earlier version of this manuscript. All authors of this manuscript certify that there is no conflict of interest or financial conflict in the conduct of the present study, in the preparation or submission of this manuscript.